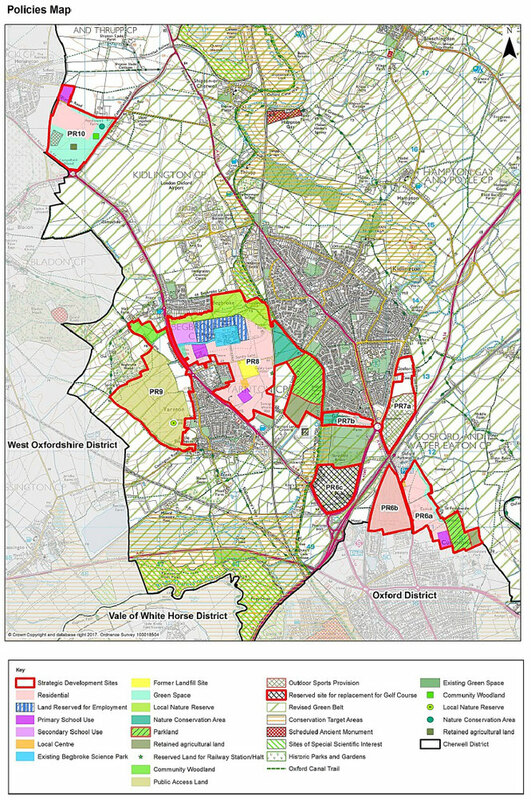 Cherwell Council’s Executive has just approved its preferred locations for 4,400 houses to meet Oxford’s overspill. In doing so it has shamelessly ignored what it admits were overwhelming objections. Over 1200 responses were received despite the complexity and timing of the consultation over Christmas. Almost all of the locations now proposed are in the Green Belt. The biggest site would be for almost 2000 houses on land between Yarnton and the railway line west of Kidlington. About 1200 are proposed between the northern edge of Oxford and Oxford Parkway station. Further sites are proposed at Stratfield Farm, Kidlington (100), between Gosford and Water Eaton Lane (230), west of Yarnton (530) and south east of Woodstock (410). The proposals are shown in this Policies Map. *Note : This map has been taken from the documents considered by Cherwell’s Executive on 19th June 2017. We believe that, in order to match the Council’s text, the areas unshaded in sites PR7a and PR9 should actually be pink to represent housing and that this is an error by the Council. sites not included in these plans may still be chosen. Developers and landowners whose sites have not been selected will be re-doubling their efforts to get the decision changed. As soon as Cherwell starts its consultation, we will circulate further information about the proposals and how to object. In the meantime, The documents approved by Cherwell Executive Committee on 19th June are available to view on their website. They include a 754 page long partial review of the Cherwell Local Plan and a 750 page 'sustainability' appraisal document. The Consultation papers will, we hope, be considerably more 'user friendly'.